The main body of 8 RAR disembarked from HMAS SYDNEY on the morning of 28th November 1969 and moved by truck from Vung Tau to Nui Dat where the advance party had been located for the preceding ten days. Familiarization and acclimatization was completed by each company undergoing in turn, an exercise using tank and artillery support in the Tactical Area of Responsibility (TAOR). December 1969 saw the Battalion on Operation Atherton which took place in the north of PhoucTuyProvince. The aim was to drive the elements of 274 Viet Cong (VC) Regiment in the border area, by reconnaissance in force, to ambush locations in the east. One company meanwhile was to work well in the south establishing movement patterns in an area in close proximity to the fire support patrol base (FSPB). This concept was successful and employed until reliable information was received of the location of the Headquarters of 3/274 VC Regiment. 8 RAR redeployed to block around the enemy location, while one company pushed through the centre of the block towards the enemy area. This operation accounted for 28 enemy KIA. Operation Keppera began on 23rd January 1970 and involved two distinct phases. Cordon and searches of selected hamlets of Xuyen Moc and the village of Nui Nhon were conducted from the 23-25th January. From 26th January – 14th February the Battalion was deployed to the Nui Dinh mountains for reconnaissance and ambush operations. Only six enemy were killed but the Battalion’s activities close to the centres of civilian population probably preventing the VC developing operations during the TET period. On 10th February 1970 ‘C’ Company with a battalion mortar section deployed to the western edge of the Long Hai hills to secure a quarry site. The remainder of the Battalion was to have gone on Operation Epsom on 16th February’ but instead ‘D’ Company on 15th February was reacted in support o a platoon of’ ‘C’ Company in heavy contact on the northern edge of Long Hai’s. Battalion HQ and ‘B’ Company moved to join ‘C’ Company the next day and Operation Epsom was postponed. Elements of ‘Support’ Company did however occupy FSPB Pat to the north east of I ATF for six weeks. Operation Hammersley developed into a reconnaissance in force by ‘C’ and ‘D’ Companies with tanks and armoured personnel carriers (APC’s) in support, while ‘B’ Company ambushed the main fire trail. Heavy contact was made with the whole of D445 in a valley in the south cast of the Long Hai’s known by the VC as Mindam Secret Zone. Three days later a B52 air strike was targeted onto the valley that had been used as a VC battalion sanctuary for several months. The operation finished and 8 RAR was deployed north to an area west of Xuyen Moc. The operation had been a notable success accounting for over 40 enemy KIA and forcing D445 from their well established base. Operation Hamilton was the proposed destruction of D445 Battalion. Companies searched AO’s until following a reliable intelligence report, ‘A’ ‘B’ and ‘D’ Companies with two additional companies from 6 RAR/NZ and 7 RAR cordoned a suspected area southwest of Xuyen Moc without contact. ‘D’ Company 6 RAR moving further to the west made contact in bunkers and companies were quickly deployed to ambush likely egress routes from the ‘D’ Company contact, however without success. Operation Phoi Hop began an entirely new concept of operations for 1 ATF and was designed to deny the enemy access into the villages. From 7-18 April the villages of Hoa Long, Ap Soui Nghe, Duc My and Binh Ba were ambushed and the operation concluded with a cordon and search of Ap Bac hamlet of Hoa Long on 18th April 1970. The operation resulted in eleven enemy killed with no Battalion casualties and the aim of the operation was achieved. Operation Nugee was conducted from 20th April – 11th June 1970. This operation was in three phases beginning with TF operation, ‘Concrete’ in which 7 RAR and 8 RAR established blocking positions in the east of the province while 6 RAR/NZ reconnoitered in force towards these ambush positions. In the second phase in the north, a similar concept was employed with 2nd Brigade 25th (US) Division and in the third phase the Battalion used those concepts and techniques which had proved successful in Operation Phoi Hop. The operation was successful as apart from the 26 enemy killed, intelligence sources revealed that not only VC but alsoD445 Battalion suffered heavily resulting in a marked reduction of enemy influence in local villages. In Operation Cung Chung 1, the Battalion again employed close cooperation with Vietnamese authorities as it had in the previous two operations. 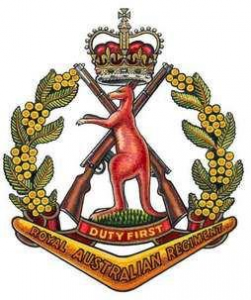 Each rifle company was responsible for a district within 8 RAR’s AO. By day check points were established on various routes thus us ensuring a degree of popular control. By night, halt platoon ambushes were conducted on likely enemy routes into villages. Operation Petrie was mounted on intelligence reports received during Operation Cung Chung 1, that D445 and elements of 274 VC Regiment were re-establishing bases in the north west of the province. The Battalion was deployed in blocking positions with APC’s and tanks. After these ambushes were in place, intensive artillery fire and airstrikes were directed on the enemy bunkers. This bombardment was followed by a joint lnfantry-Armour reconnaissance, the aim of this being to force the enemy to flee along likely withdrawal routes and therefore into the pre-positioned ambushes. The operation resulted in the destruction of four enemy camps that had been occupied by both regional and main force enemy units and the severe disruption of the enemy resupply programme. The Battalion’s final operations, ‘Cung Chung II and III’ were designed to continue the tight hold on the population centres. In the main, the Battalion concentrated on the ambushing of local enemy routes to and from Hoa Long. Of particular note in this regard was the ‘C’ Company ambush on 12th August l970 in which 8 Platoon ambushed an enemy party leaving Hoa Long resulting in 9 enemy killed and 5 captured. Ambushing continued near Hoa Long until 25th October when 8 RAR ceased operations. A Memorial Parade was held on 23rd October 1970 in memory of those 18 Battalion soldiers killed in action. On 28th October 1970 at a parade at Nui Dat, the Commander Military Region III and III Corps, General Do Cao Tri, presented the Vietnamese Meritorious Unit Commendation to the Battalion and individual awards for gallantry and distinguished service to some 26 members of 8 RAR. On 1st November 1970 USAF Chinook helicopters ferried the main body of the Battalion from Kapyong Pad, Nui Dat to the deck of the HMAS SYDNEY for voyage home to Australia. On 12th November l970 the Battalion marched through the City of Brisbane. 31st October 1973 8 RAR was linked 9 RAR to form the new battalion 8/9 RAR.